While most hand choppers require you to push down to chop, this uses pulling action that spins the blades – like the pull-start on a lawnmower, but on a much smaller and easier scale. A nonskid ring on the bottom of the bowl keeps it from slipping, so you just rest a hand on top and pull the handle with the other hand. 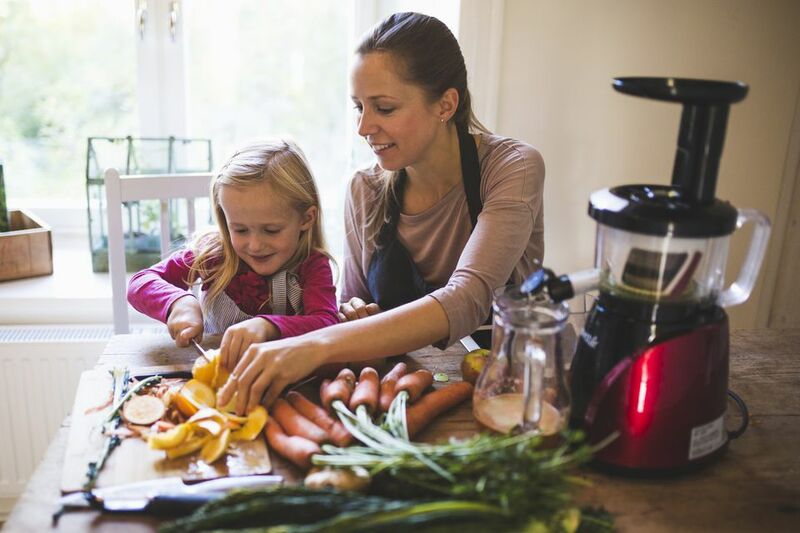 The spinning blades work like a food processor for chopping foods as coarsely or finely as you like, and since the blades continue spinning after you pull, it only takes a few pulls to chop all the ingredients in the bowl. The blades are removable, so after chopping your cole slaw, you can remove the blades to add the dressing and mix. This holds about two cups. The lid should not be immersed in water or washed in the dishwasher, since it’s difficult to get the water out. This mini food processor won’t knead dough like a big food processor can, but it will make quick work of chopping everything from apples to nuts to zucchini, and it can also blend small amounts of foods into purees, or emulsify your salad dressing. The blade is auto-reversing for the best grinding or chopping action, and the 3-cup bowl makes a nice batch of salsa without needing to empty the bowl over and over. With this little machine, you can chop herbs, garlic, or vegetables, grind spices or hard cheese, puree vegetables, and make mayonnaise or emulsified salad dressings. There are two simple buttons (chop and grind) for easy operation. The bowl and lid are dishwasher safe for easy cleaning. A spatula is included. This vintage-style one-piece chopper is the ultimate in simplicity, with no moving parts, no jar, and no extra pieces to keep track of. Best used in a flat-bottomed bowl, you simply push down to chop foods. Since it’s not confined in a small jar or bowl, you can chop large quantities of food. While a bowl is the best option, it can also be used on a cutting board. It’s great for chopping nuts, fruits, and vegetables. Users say it’s the ideal tool for making tuna or egg salad, and because of the long handle, it can be used in a cooking pot to chop cooked greens or similar foods. When it’s not being used for chopping, you can use it to tenderize meats or cut cookies, biscuits, or pastries. This is made from rust-proof stainless steel. Hand washing is recommended. The zig-zag blade in this chopper performs more cuts per push than choppers with an x-blade, and the blade rotates with each push so food is chopped more evenly. Wipers scrape food off the blade with each cut, so you won’t have large pieces of food stuck to the blades where they won’t be cut. This comes apart for cleaning and can be washed in the dishwasher. It comes with a cover, so the base can be used for storage. Chopping onions is one of the most-hated kitchen tasks, particularly for people who tend to get watery eyes while chopping – not to mention the annoying scent of onion that clings to fingers. While this can be used for cutting other foods, like firm tomatoes, bell peppers, mushrooms, or similar foods, it’s ideal for onions, since the onion layers combined with the chopping grid result in diced onions with one swift motion. There are three different cutting grids: 1/4 inch dice, 3/8 inch dice, and one that creates 1/4 inch slices or strips. The blades are stainless steel and all parts are dishwasher safe for easy cleaning. A lid is included so food can be stored in the container for later use. It holds about six cups. Like similar choppers, this isn’t ideal for soft tomatoes, but it works very well for celery, which often thwarts choppers because of the strings. Over time, the blades can become dull and won’t cut as well. However, replacement blades can be purchased from the manufacturer. If you use a lot of nuts for baking, for topping ice cream, or for making candy, but you don’t mind hand chopping your vegetables, a dedicated nut chopper might make sense. This vintage-style chopper has a glass jar and 18/8 stainless steel blades. The container holds 1 1/4 cups. This has an upper hopper that holds the shelled nuts to be chopped. Just turn the handle to chop the nuts, which then collect in the lower glass jar. This chopper works for just about all types of nuts. The hopper should be hand washed in warm soapy water. The glass base is dishwasher safe. 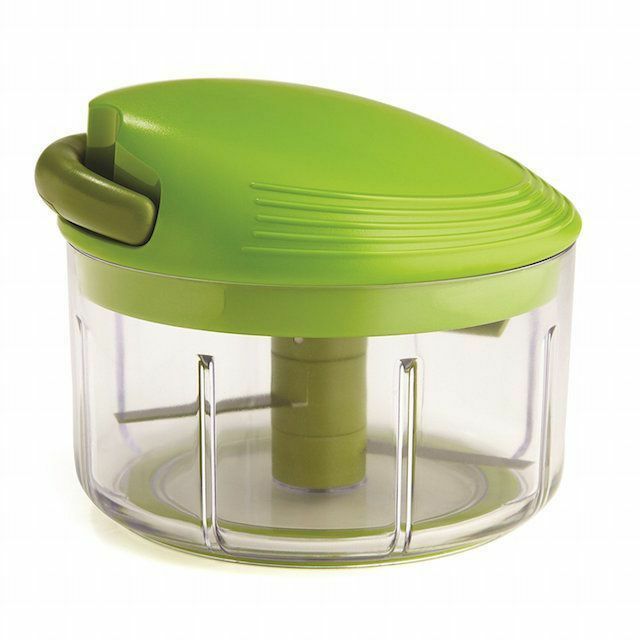 This little food processor has many of the features of a full-sized machine, with a small 3 1/2 cup bowl. The blade locks in place, so you can empty the bowl without the blade dropping out, and there’s a handy pouring spout for dispensing liquids and purees. The lid locks on so you can operate the machine without having to hold the lid in place. There are two speeds with pulsing, so you can get finely or coarsely chopped foods. A drizzle hole lets you add oil or other liquids slowly. The work bowl, blade, and lid are all dishwasher safe for easy cleaning.